John "Jack" Franklin Brown, Jr. Celebrating the life of John "Jack" Franklin Brown, Jr.
Obituary for John "Jack" Franklin Brown, Jr.
Jack Brown, known by many as “The Gospel Trumpet” moved to his Heavenly home on Wednesday, October 10, 2018. Jack began playing trumpet in the 5th grade and he enjoyed tooting his own horn for over 60 years. 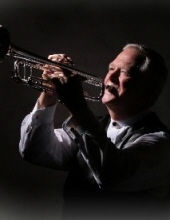 He will always be remembered for his ability to play the trumpet in a Southern Gospel style and his love for playing the old hymns for his Christian brothers and sisters. His Gospel Trumpet website is wttp:www.gospeltrumpetmusic.com where photos and some of his recorded music can be heard. You are welcome to leave comments for the family at Jack’s website. You are also encouraged to read and ponder Jack’s favorite Bible verses, 1 Thessalonians 5:17-18. Jack was preceded in death by his dad, John F. Brown, Sr. in 1967, his mother, Ellen (Brown) Gray in 2018, his mother-in-law, Alice Ratliff in 2001, and father-in-law, Reese Ratliff in 2016. Survivors include his wife, Donna, who was his true soul mate; siblings, Chad Brown of Staunton, and Adena (Brown) Lightner, of Walnut Cove, NC. He is also survived by an “adopted” son, Shane Ayers of Staunton; and godsons, Ben Miller, Jr. of Richmond, VA and Chris Miller of Lavon, TX. Ben and Chris were sons of Jack’s longtime friend, Ben Miller who was tragically killed on his motorcycle in 2009. A Service of Remembrance will be held at Coffman Funeral Home Chapel at 2:00 p.m. Tuesday, October 16, 2018, with Pastor Ron Nickell, Jr., (Mt. Ed Baptist Church) presiding. Active pallbearers will be Leon Johenning, Frank Thacker, Lynn Sullivan, Don Flory, Les Fink, and Lowell Roberson. Honorary pallbearers will be Tim Byrd, Greg Smith, Kenny Shoemaker, Dale Cook, Ben Miller, Chris Miller, Pastor Larry Strickler, Pastor David Whitesell, Malcolm Campbell, John Pappas, Tommy Westhafer, Roy Lilly, Jim Rudine, Danny Mawyer, and Pastor Merle Dodson. It is suggested those desiring make memorial contributions to Mt. Ed Baptist Church, P.O. Box 237, Batesville, Virginia 22924. To send flowers or a remembrance gift to the family of John "Jack" Franklin Brown, Jr., please visit our Tribute Store. The family will receive friends following the service. Burial will be private in Augusta Memorial Park. "Email Address" would like to share the life celebration of John "Jack" Franklin Brown, Jr.. Click on the "link" to go to share a favorite memory or leave a condolence message for the family.